This photo was taken a few days ago on a wet wet day. The walls are partially wet. This is the Keretapi Tanah Melayu or translated Malaysian Railway. It's the railway service from neighbouring Malaysia that terminates near the Financial Centre of southern Singapore. Interesting eh? 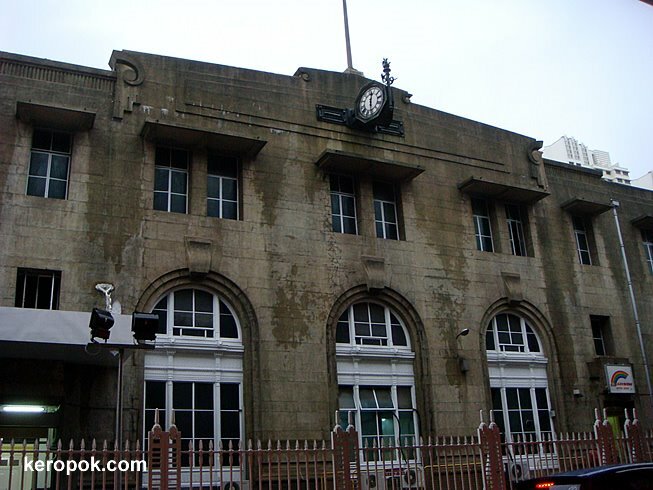 Some people like to take the railway to Kuala Lumpur from this Tanjong Pagar Station. If you purchase your tickets here, you pay say SGD19 (cheapest day fare). If you just board from the next station which is in Johor Bahru, you pay only MYR18. Now that's almost half price off! 1 SGD = 2.3 MYR. Lovely shot! I really miss this place. Do KTM still use this place or have they shifted to Woodlands?